Please note: The following is a synopsis of ZEHUT’s Peace Plan. To see the full version, click here. Since the Oslo Accords, there has been a transformation of the value system of the IDF and of all the security forces in Israel. From the concept of ‘decisive victory’ aimed at creating a formidable deterrence against the enemy that would prevent future attacks on Israel, the IDF adopted the concept of ‘containment’. This concept leads to ’rounds of fighting’ every few years, a constant threat of missiles and tunnels and a nuclear threat – a reality that is accepted as given. Victory is no longer in the IDF’s conceptual world, because the society that sent it to fight no longer believes in the justice of its existence and in its right to defeat its enemies. Zehut intends to bring about a change in values ​​that will restore the IDF to its original pre- Oslo mentality. The following are mostly practical expressions of this conceptual change. The technological changes and fluctuations that have taken place in the security situation in Israel in recent decades require a change in the IDF recruitment model. Today the IDF needs a smaller, more quality force that has undergone prolonged training. In the current situation, many of the IDF recruits are not really needed. Zehut’s vision is to shorten the compulsory service that applies to everyone to basic training only. After the basic training period, anyone interested in continuing to serve in the professional army will be able to apply, and from among the candidates, the army will choose those who it really needs. The recruits will be paid an honorable salary derived from the average wage in the economy. They will receive the most advanced training and equipment, an academic education, gain high social status by virtue of their contribution to the security of the state, and will enjoy good conditions. Zehut will advance this process gradually and in coordination with security officials. Israel’s policy regarding Iran’s nuclear weapons is disastrous. Indeed, the main problem lies not in the potential for the weapons to harm Israel but in the process of de-legitimization and the loss of the justness of Israel’s existence in the eyes of the world – in the wake of Israel’s lack of response to those calling for its destruction. Zehut does not see American aid to the State of Israel as a cardinal guarantee of its security, never to be relinquished. The price of this “gift” is too high. In terms of security, receiving aid creates Israeli dependence on America, which then receives legitimacy to intervene in Israeli security matters. A foreign element that regularly interferes in Israel’s decisions and prevents the freedom of military action is a serious blow to Israel’s security. From the economic point of view, too, American aid is a losing proposition for Israel. Behind the restrictions on the export of Israeli arms, the United States recognizes the great potential of the Israeli defense industry. Israel’s dependence on American weapons prevents it from investing in its own development, which is capable of competing with the American military industry. Therefore, Zehut will cancel the receipt of American aid. As a background to the plan, we must examine the process that the State of Israel has undergone since the signing of the Oslo Accords. Ostensibly, the purpose of these agreements was to end the conflict by establishing a Palestinian state, thereby achieving peace. But this goal has not been achieved. Rather, the opposite is true: the number of people killed in terrorist attacks increased fivefold (1552 between 1994 and 2015, compared with 357 between 1977 and 1994). More and more cities in Israel began to be bombarded with missiles and Israeli citizens were expelled from their homes (during the Disengagement in 2005). 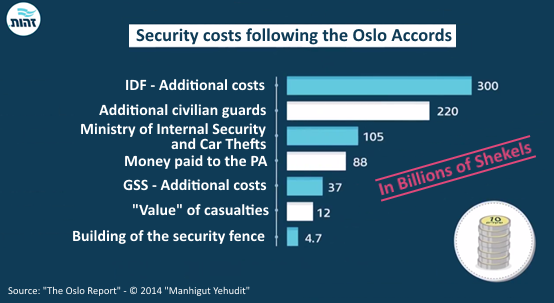 In addition, the Oslo Accords were supposed to bring economic well-being as a result of the anticipated cut in defense spending, but in fact the state paid more than NIS 1 billion for implementing the agreements. In light of all this, the question arises: Was the purpose of the Oslo Accords really to achieve peace? In other words, the Oslo planners saw the two-state solution as a means to resolve the struggle for identity. Zehut challenges this “Oslo concept” and proposes an alternative political plan called “one state for one people”. The program is based on loyalty to the Jewish identity of the state and the justness of its path, and at the end of the process will lead the State of Israel to a reality of peace. The Land of Israel belongs to the people of Israel alone by Divine choice. International law recognizes that the territory of Judea and Samaria is designated for a Jewish state, as Justice Levy’s report showed. The demographic trend is in favor of the Jews, and by 2035 a majority of 80% of Jews are expected to live in Israel, from the Mediterranean to the Jordan River. Most Arab residents of Judea and Samaria want to emigrate and many already do so. Stage One: The Oslo Accords will be canceled and the legal situation restored to its pre-Oslo status. Second stage: The terrorists will be offered a peaceful withdrawal, similar to the PLO withdrawal from Lebanon in 1982. Third stage: The IDF will take over the territory as it was able to do in Operation Defensive Shield, and the State of Israel will apply its full sovereignty over all parts of the country. No element except for the IDF, the Israel Police and authorized civilians (see above) will carry arms. Residency: Those who wish to remain and declare their allegiance openly will receive the status of permanent residents in the Jewish state. All their human and property rights shall be preserved in the same manner as permanent residents of other Western countries (as the United States does with the inhabitants of Samoa, the Virgin Islands and Puerto Rico, and Britain with the Cypriots remaining under its control). When the people of Israel adopt their true identity and stop seeing themselves as an occupying force in their own country, the rest of the world will leave the conflict behind and accept our legal sovereignty. In addition, the full implementation of the plan will open Israel’s heartland to settlement, construction and development. The future generations will not inherit the problem of the territories and terrorism, but will receive a sovereign, secure and prosperous state. The State of Israel must be a moral role model for the rest of the nations. According to this view, Israel will continue to develop many ties with foreign countries but will not compromise on moral principles. For example, the State of Israel will stop selling arms and military knowledge to regimes that commit crimes against humanity and violate human rights. Jerusalem in general and the Temple Mount in particular are at the core of Jewish national existence throughout the generations. Zehut will work to develop Jerusalem as the capital of Israel. With the realization of its political program (see above, “The Diplomatic Plan”), the conflict will disappear, and the non-Jews who will remain in Jerusalem are those who will accept the sovereignty of Israel. In light of this, it will be possible to expand the boundaries of the city in the east and north, in order to create “greater metropolitan Jerusalem”. The Jerusalem Metropolis will include Bethlehem and Gush Etzion in the south, Beit Shemesh and Modi’in in the west, Ramallah in the north, and Ma’aleh Adumim and Jericho in the east. In addition, Zehut will improve access to Jerusalem through a variety of strategic infrastructures such as ring roads, construction of an international airport, improvement of the mountain road and roads in East Jerusalem, especially around the Old City. Zehut will strive to transfer the government complex, the Knesset building and the Supreme Court from the west of the city to the Old City in the areas adjacent to the Temple Mount. The Temple Mount is not the epicenter of a religious conflict, but the beating heart of the entire nation. There is a direct connection between the loss of Israel’s hold on the Mount (since it was actually handed over to the Moslem waqf) and the loss of the international legitimacy of the State of Israel. Over the years, Israel’s leaders, Left and Right, have done everything possible to “escape” from dealing with the Temple Mount. Zehut strongly opposes this policy, and sees the return of full Israeli control over the Mount as a national goal of the highest order. Accordingly, Zehut intends to distance the waqf – or any other foreign entity that is not subject to Israeli sovereignty -from the Temple Mount. The Israeli police will be permanently stationed on the Mount – not at its edge, as is currently the case. Visits to the Temple Mount will be possible at all hours of the day without restriction, and the security of the citizens of Israel on the Mount will be absolutely assured, with the recruitment of all the necessary police forces. Access to the Temple Mount for Jews will be permitted through all the gates, without any reservation. By virtue of the Law for the Preservation of the Holy Places, Zehut intends to hand over the Temple Mount to the Chief Rabbinate, which will also be able to regulate the ascent and prayer of the Jews on the Mount to the permissible areas within the framework of Jewish law and demarcate those areas.. A Jewish synagogue will be built on the Mount. In addition, the Temple Mount will be opened for archeological research without the current restrictions.